The LSU Department of Mathematics is now delivering Math 1021 College Algebra, Math 1022 Trigonometry, and Math 1023 Precalculus using a model that it developed as a selected member of the 2003-2006 FIPSE-funded Roadmap to Redesign (R2R) program developed by the National Center for Academic Transformation (NCAT). The goal of this program was to spread redesign practices that resulted from an earlier 1999-2002 NCAT program funded by the Pew Charitable Trust entitled Program in Course Redesign (PCR). These practices involved redesign of large-enrollment courses through effective use of technology to reduce costs and increase student learning. The newest NCAT program, Colleagues Committed to Redesign (C2R), is continuing to spread these redesign practices. In addition, interest has grown to include State and System Course Redesign programs, and a membership organization named 12the Redesign Alliance has been formed by NCAT. The institutions in the PCR using mathematics redesigns were Virginia Tech, the University of Alabama, and the University of Idaho. Other institutions now using similar designs for mathematics are UNC at Chapel Hill and Greensboro, Georgia State University, Ole Miss, Wayne State University, the University of Arkansas, the University of Nebraska, Oklahoma State University, the University of Central Florida, Auburn University, and Southeastern Louisiana University. Mathematics is not the only discipline involved in NCAT redesign programs; Spanish, English, biology, chemistry, statistics, and psychology are also included. The LSU model features a combination teacher-directed classroom setting and student-centered learning lab design that requires much more active participation from students than passive lecture-only formats of the past required. 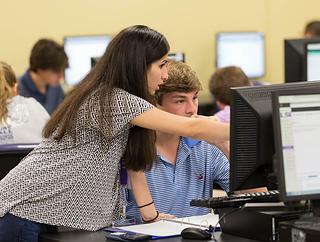 At LSU, students in the 3-credit hour courses (Math 1021 College Algebra and Math 1022 Trigonometry) spend one hour a week at a fixed time in a small classroom with their teacher and then spend a minimum of 3 flexible hours a week in the teacher- and tutor-staffed learning lab. For the 5-credit hour course (Math 1023 Precalculus), students spend two fixed hours a week in a small classroom with their teacher and then spend a minimum of 5 flexible hours a week in the teacher- and tutor-staffed learning lab. In the classroom, teachers connect topics and concepts, work examples pointing out common student errors and misconceptions, and help to guide students through their semester responsibilities. 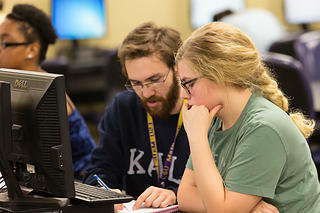 In the LSU Math Lab, help is available 60 hours a week. There teachers and tutors give students immediate, personalized help with math concepts and skills. In addition, they are also available to help students with computer-use questions that may arise. This holistic design for learning mathematics promotes an active approach to learning that addresses a myriad of student learning styles. It emphasizes students “doing” mathematics, not just “watching” someone else do mathematics. The repeated opportunities for practice exercises accompanied by specific, individualized feedback promote learning each new concept to mastery level. All assessments are delivered using specialized software called MyMathLab. Homework, quizzes, and tests are taken using exercises algorithmically generated by the software. Help and Example buttons guide students through the homework, and the textbook and streaming videos can be accessed through the software as well. Individual videos for each section in all three courses, taped at LSU using experienced instructors and professors, are available on the math website for those students who want additional classroom instruction. Homework can be attempted an unlimited number of times, and quizzes can be attempted up to ten times before the due date. 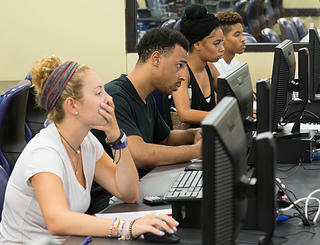 The proctored, password protected tests are taken in the LSU Center for Assessment and Evaluation Himes testing center following a flexible, student-friendly schedule. Prior to the development of this program, the fall A-B-C success rate for Math 1021 College Algebra averaged about 64%. After running a semester pilot and several semesters of combinations of delivery methods while constructing the 275-seat learning lab and making improvements on the LSU course design, the Fall 2006 results for Math 1021 College Algebra showed the success that the program has achieved. The record low drop rate of 6% combined with the final exam median of 78% and the highest-ever A-B-C success rate of 75% was exceptional, not only in LSU history but also in national comparisons. In Fall 2007, the rigor of Math 1021 College Algebra was increased slightly, and the A-B-C success rate was 67%. In Math 1022 Trigonometry and in Math 1023 Precalculus, fall success rate have continued to match or exceed success rates prior to redesign. See the attachments below for complete data. At Louisiana State University, we are very proud to be at the leading edge of those institutions appropriately using available technology to promote student learning in mathematics. We have a group of dedicated people working to insure that we continue to bring the best education possible to our students. 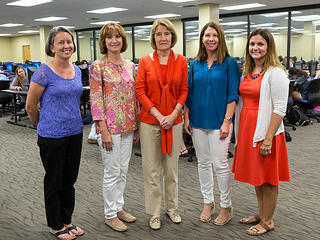 The administrative team consists of the following LSU faculty members (pictured from left to right in the photo at the top of the page): Stephanie Kurtz, Math 1022 Course Coordinator and Math Lab Data Manager; Debra Kopcso, Math 1021 Course Coordinator; Phoebe Rouse, Precalculus Mathematics Director; Selena Oswalt, Math 1023 Course Coordinator; and Lindsay Waddell, Tutor Supervisor. For information on how to get started on course redesign, see How to Do It by the National Center for Academic Transformation (NCAT). For a semester-by-semester description of LSU's participation in NCAT's Roadmap to Redesign (R2R) program, see the Project Abstract, which includes the 2005 and 2006 Interim Reports and the Final Project Report. For information regarding the details of setting up an emporium, see How to Structure a Math Emporium, Advice from NCAT's Redesign Scholars.